One of the most exciting things about having a new NBA team in town was that all the superstars in the NBA would now visit twice. We knew people who would buy partial season tickets to the New Jersey Nets, schlepping all the way out to East Rutherford if necessary, just so they could see Kobe, or Shaq, or even Michael Jordan. Even if the Nets weren't good, they were worth watching sometimes just for their opponents. (Knicks fans, before the last three seasons, can relate.) Now that the Nets are in Brooklyn, they're better, but the cathartic kick of NBA megawatt stars roaming these streets hasn't abated. There's just something great about the fact that Kevin Durant was playing just down the street last night from Mo's Fort Greene, you know? 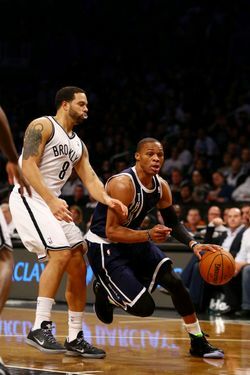 The Nets lost a fun-to-watch 117–111 thriller to the Oklahoma City Thunder last night, but when you lose to a team as good as the Thunder in a good game like that, there are plenty of positives to take away. The biggest might have been the shooting of Deron Williams. The would-be superstar hasn't quite figured out his shot yet this year, but he had it going last night, scoring 33 points, with five three-pointers. He also became the first-ever Brooklyn Net to go over 30 points; let's call him the franchise leader now, sure. The problem with the Nets last night was that they couldn't stop the Thunder from scoring, which is a problem that most NBA teams share. Durant and Russell Westbrook scored 57 points between them, and the Nets, for all their offensive prowess, just couldn't quite keep up. It didn't help that, once again, Joe Johnson couldn't hit anything, going 1-for-7 from three-point range (though he did have a decent fourth quarter). If you want a sign that the Nets still have a ways to go toward "taking over the city," note that Johnson, the fifth-highest-paid player in the NBA, doesn't receive near the Overpaid Bum! scrutiny you would expect from a city athlete. When Johnson starts getting more gruff, you'll know the Nets have arrived. Anyway, the loss was the Nets' second in a row, dropping them to 11-6 on the season, a game-and-a-half behind the Knicks for the Atlantic Division lead. They're entering an easier part of their schedule, though, with four of their next five at home (and the only road game being at Toronto). The Nets aren't going anywhere. Heck, someday soon, other towns will get excited to have them visit. They might be doing that already.